Title: 'REGNI HISPANIAE POST OMNIVM EDITIONES LOCVPLE'SSIMA DESCRIPTIO'. From the 'Theatrum orbis Terrarum' atlas. 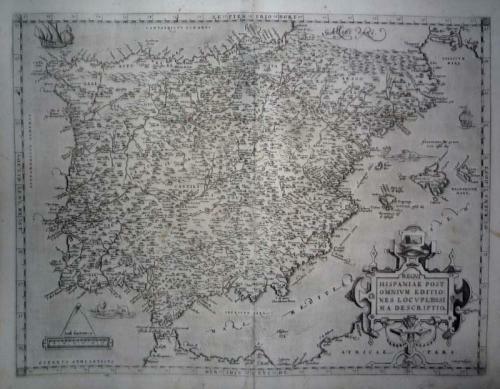 An elegant map of Spain and Portugal derived from Vincenzo Paletino's 1551 map, updated by the botanist Charles de l'Escluse (1529-1609). In very good condition with a small repair at the centerfold. A few old and faded red underlinings within the image.